Why buy Apple Cider Vinegar Complex? Apple Cider has been around for many centuries and has long been considered to provide amazing health benefits - you could say it's one of nature's gifts to mankind. We've all heard the famous saying "an apple a day..." however it is based on good evidence as to how the nutritional benefits of apples can benefit us in many ways. Our apple cider complex capsules are made in a two step fermenting process, firstly by combining crushed apples with yeast to convert their sugar into alcohol and secondly bacteria is added to ferment the alcohol into acetic acid. Acetic acid is the main active component of apple cider vinegar. Each of our capsules provide 500mg of genuine Cider Vinegar, the active ingredient acetic acid is rich in the B vitamins Thiamin (B1), Riboflavin (B2) and Vitamin B6. 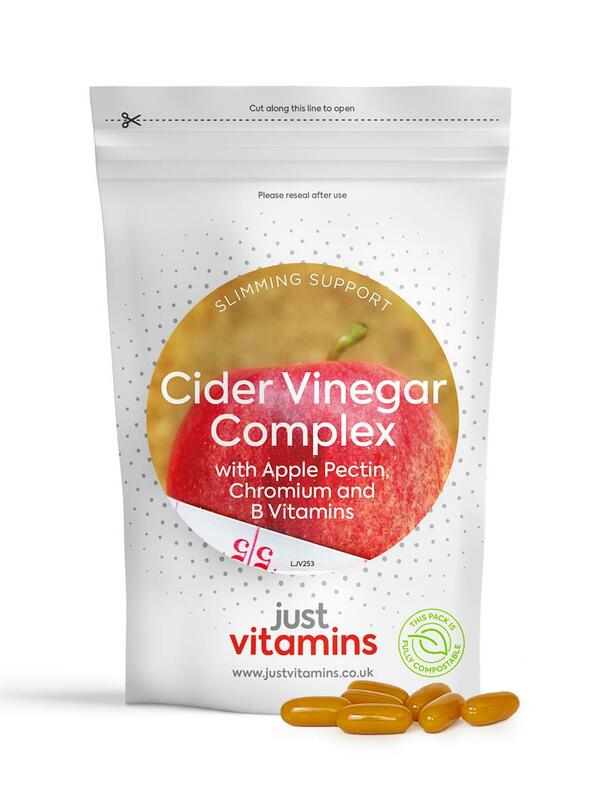 Our cider vinegar capsules also provide Chromium which helps to maintain normal blood glucose concentrations and Apple Pectin, a soluble fiber that is thought to bind to cholesterol and help carry it out of the body, thereby contributing to normal blood cholesterol levels. Reducing cholesterol levels like this is important in reducing heart disease risk. When combined with a healthy eating and exercise plan, our cider vinegar capsules help support the body’s metabolism, increase the release of energy from food, and support the metabolism of fat. Thiamin plays an important role in maintaining a healthy nervous system and improving the cardiovascular functioning of the body. Riboflavin is used by the body for the development and function of the skin, and is also important for eye health. Vitamin B6 also known as pyridoxine, has many benefits including providing support to the nervous system, brain function and red blood cell formation. It can also aid in reducing tiredness and fatigue and without it the body would not be able to absorb vitamin B12. Cider Vinegar Extract (with Maltodextrin), Gelatin, Bulking agent (Refined Sunflower Oil), Apple Pectin, Humectant (Glycerol), Refined Soybean Oil, Emulsifier (Sunflower Lecithin), Thickener (Beeswax), DL Alpha Tocopherol Acetate, Pyridoxine Hydrochloride, Thiamine Nitrate, Riboflavin, Chromium Chloride.